You can import all sorts of image files using the Library view to reuse them throughout your projects as templates. You can import bitmaps as well as vector-based images, which can be really handy. The supported image formats include: *.ai, *.pdf, *.tvg, *.pal, *.scan, *.sgi, *. tga, *.yuv, *omf, *.psd, *.png, *.jpg, *.jpeg, *.bmp and *.tif. Find and select your image file and click Open. The selected file appears in the Library view as a *.tpl file inside the selected library folder. You can import three types of audio files, which you can drag in the Timeline view when creating your animatic project. The supported audio file formats are: *.wav, *.aif and *.mp3. The selected audio appears in the Library view as a *.tpl file inside the selected library folder. You can import an Adobe Flash movie file, *.swf, into the Library view. The movie file will become a single layer template that contains the animation. Only the first 20 first frames of the animation will be imported in the template. Find and select your Adobe Flash Move file (*.swf) and click Open. The selected *.swf appears in the Library view as a *.tpl file inside the selected library folder. NOTE: You can preview the animation contained in the new template by using the preview section of the Library view—see Previewing the Contents of a Template . You can import template (*.tpl) files made in Harmony 9.2 or higher into the Library. This can be useful for importing backgrounds created in Harmony directly into your storyboard. NOTE: As Stage is an animation software and Storyboard Pro is not, animated templates and templates of rigged puppets created in Stage may not import properly. Templates with multiple layers will retain their layer structure, but cut-out puppets may be rendered as flat objects with unmoving parts. In the Library view, right-click in the left side of the Library view, under all the existing folders and select Open Library. From the browser window, search for a folder that contains the *.tpl file that you want to import. That folder is considered the “Library” that you chose to open. The *.tpl file itself is also a folder, so do not get confused. Select the Library folder and not the Template folder. 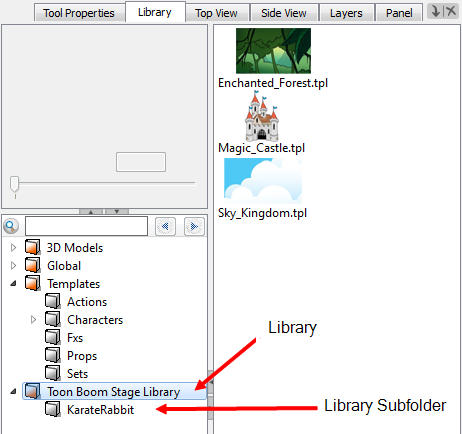 For example, the library may be the Toon Boom Stage Library (found in the My Documents folder on Windows) and the name of the template inside Enchanted_Forest.tpl. An orange book icon appears in the left side of the Library view with the name of the folder that you selected. Click it to see the templates on the right side of the Library view. The template thumbnails may take a moment to generate. If there were any subfolders in the root library folder, they will appear as grey books within the root library. You may need to expand the root library to see them. Click on one of these grey book subfolders to reveal its templates on the right side of the Library view. You can import four types of 3D files, which you can drag in the Timeline view when creating your animatic project. The supported 3D file formats include: *.osb, *.3ds, *.obj and *.fbx. When you import a 3D model, it is automatically added to the Library in the 3D Models folder according to its format. You can then reuse that 3D model easily within your project file. In the Library view, right-click the 3D Models library folder, and select Import Files. Find and select your the 3D file and click Open. The selected 3D file appears in the Library view in a folder labeled according to its format (ex. : OsbModels for *.osb files). From the browser window, search for the folder that contains the *.osb, *.3ds, *.obj or *.fbx files that you wish to import. That folder is considered the “library” that you chose to open. If there were any other readable files in the same folder, such as *.tga files used for the 3D objects texture, they may appear in the new library as well. NOTE: If your 3D template is animated, you can preview the animation by using the Preview section of the Library view. Refer to the Previewing the Contents of a Template to learn how.